Uh-oh, here comes The Joker! This imposing statue stands about 12-inches tall. In the unique style of Batman: The Animated Series. 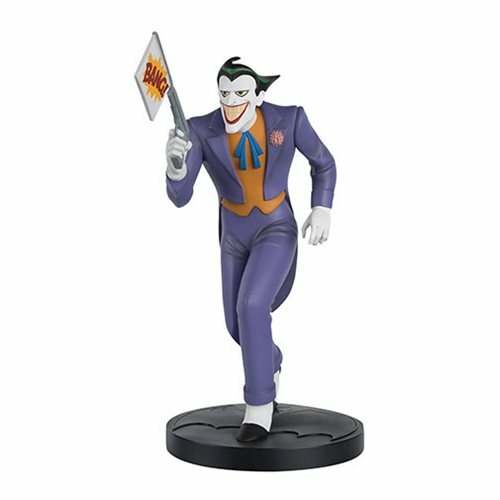 The Batman: The Animated Series Special Mega Joker Statue with Collector Magazine #2 from Eaglemoss Hero Collector is inspired by Batman: The Animated Series. It makes an impressive addition to any collection. Standing about 12-inches tall, the imposing statue is sculpted to capture the unique style of the show, and then hand painted. This mega-figurine is limited to 1,000 pieces and comes with a numbered certificate of authenticity!